After smudging the table-counters, dirtying several table cloths and tea towels and numerous pots, bowls and plates with lots of chocolate and butter, I’ve finally prepared a MasterChef plated dessert for Aspiring Bakers and Cook Like A Star. Phew! The theme for this month’s Aspiring Bakers is Desserts on a Plate hosted by Swee San from The Sweet Spot while the theme for Cook Like A Star is MasterChef, hosted by Zoe from Bake for Happy Kids, Anuja from Simple Baking and Baby Sumo from Eat your heart out. So I was trying to kill 2 birds with 1 stone (or rather play-cheat by participating in 2 baking events with just 1 recipe) and luckily I found a recipe that fits the criteria on MasterChef website! 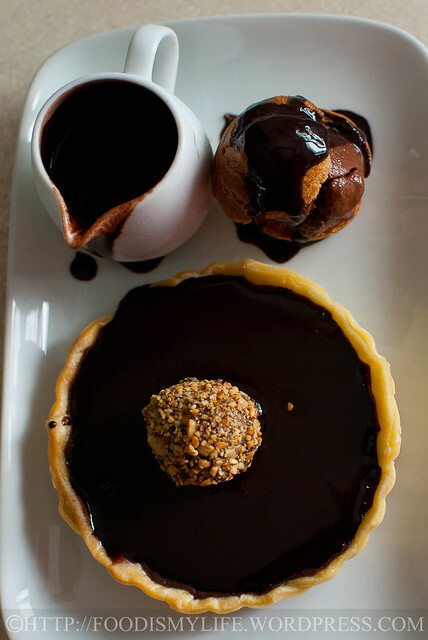 This plated dessert consists of 2 main components: the chocolate tart and the chocolate sorbet. The original recipe also included a macaron which I didn’t have time to bake it so I swapped it with some frozen profiteroles that I made earlier. The filling is mainly made of dark chocolate (I used Varlhona) so it’s rich and intense. 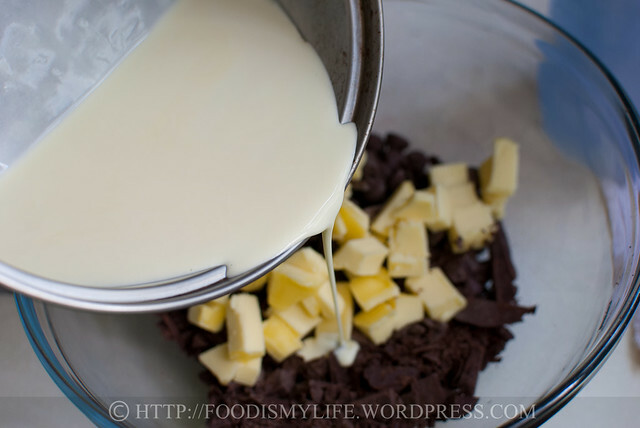 It’s pretty easy to make, just have to melt the chocolate then whisk in everything together. Paired with the bitter-sweet chocolate sauce – the overall tart is very dark, rich, and extremely intense – so if you’re not a fan of dark chocolate, do swap the dark chocolate with milk or semi-sweet chocolate. The cake ball on top is made using left-over cake mixed with frosting, then rolled into balls, dipped into chocolate and then into toasted peanuts. I didn’t have any mint to garnish the tart with, so I decided to use the cake ball instead :p You can actually see how shiny the chocolate sauce is – the reflection of the cake ball can be seen! The sorbet is even easier to make – only 3 ingredients is needed – chocolate, water and sugar. Again, as dark chocolate is used, it’s extremely rich. Luckily my profiterole is not very huge in size so I needed only a small scoop. Overall it’s a very rich and intense dessert – I couldn’t finish the tart (4-inch in diameter) by myself, partly because it’s too rich. So I’d recommend making the tart smaller (about 3-inch in diameter). I’ve adjusted the recipe below – this recipe makes a lot of tarts, so I think if you’re not making for 10 people, you can scale it down further. P.S. Step-by-step photos for Profiteroles and the Chocolate Sauce are already covered, so I’m skipping straight to the step-by-step photos for the sorbet and the tart! 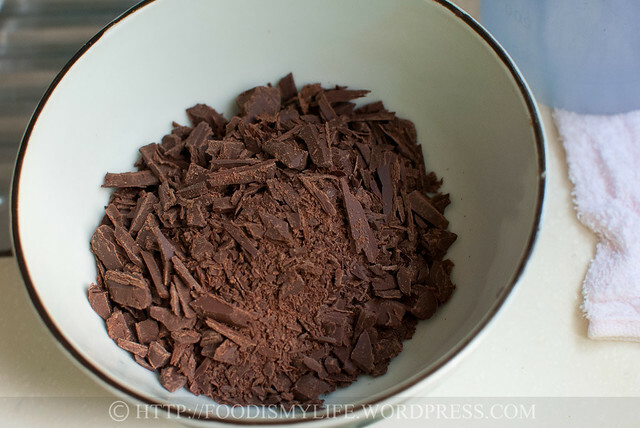 For the sorbet: grab some good-quality dark-chocolate and chop them as finely as you can. Pour some water into some sugar and bring them to a boil. Pour it over the chopped chocolate. Don’t worry about the chocolate seizing up, when there’s sufficient hot water, the chocolate will melt! Strain the mixture into a large container (so that it freezes easily and faster). Whisk the mixture every 30 minutes of freezing for 4 times. Then transfer into a small container and freeze till firm. Here’s a snap-shot of the chocolate sorbet before we move on to the tart! 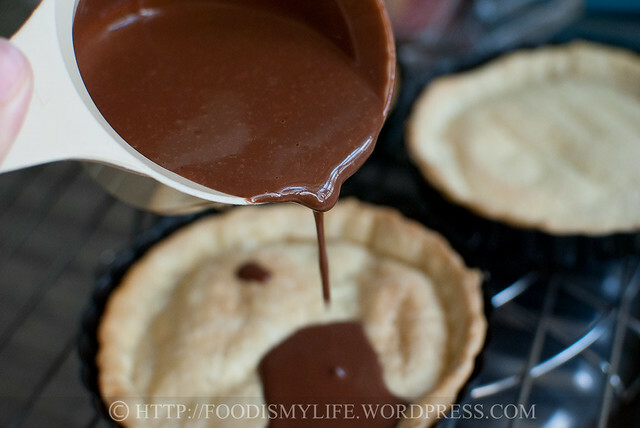 For the tart: measure some semi-sweet chocolate (or milk chocolate), butter and dark chocolate in a bowl. Pour almost-boiling heavy cream over the mixture. Stir to melt and let cool slightly. 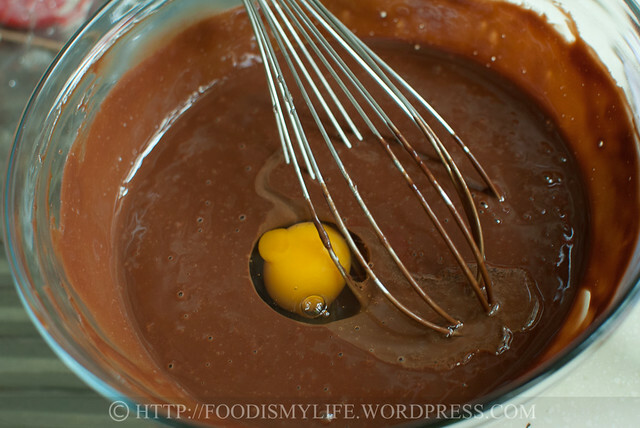 Whisk in the 1st egg. Followed by the 2nd egg. And then another egg yolk and some vanilla extract / paste. It’s gonna be a very, very rich tart! Pour the tart filling into the pie crust and bake until set. 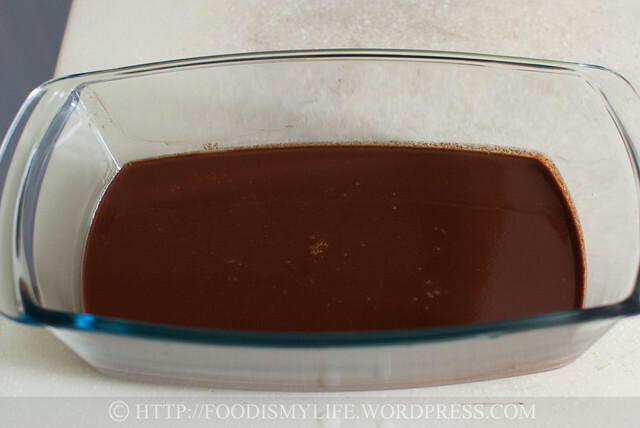 3-Minute Easy Chocolate Sauce, warm or at room temperature. Place the tart on the serving plate. 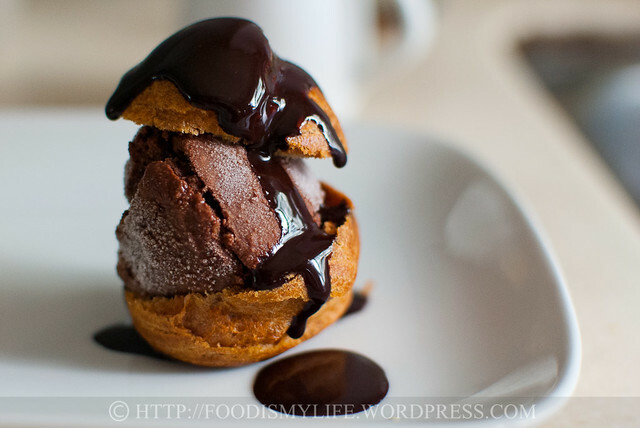 Split the profiterole into 1/2 and fill it with the sorbet. Replace the top and place it next to the tart. 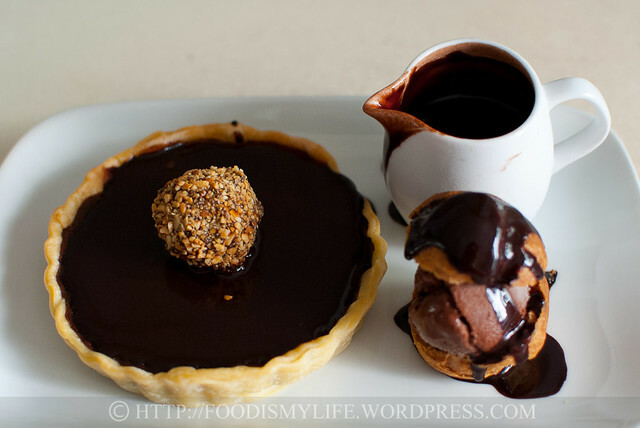 Pour the chocolate sauce over the tart (I pour enough to cover the surface of the tart) and the filled profiterole. Place the truffle / cake ball in the middle of the tart if using. 100 grams good-quality dark chocolate, minimum 65% cocoa solids, finely chopped. 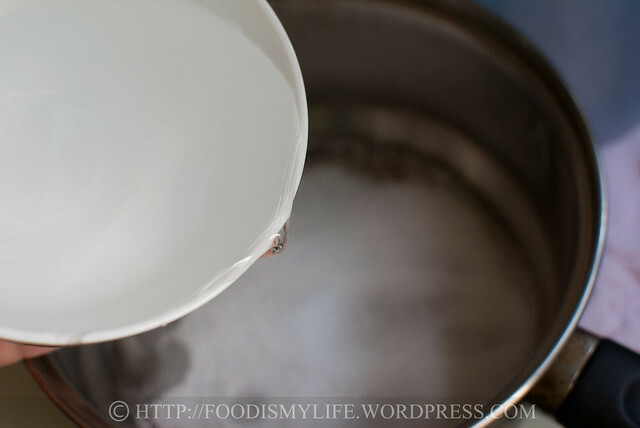 Combine sugar and water in a small pot and bring it to boil. Pour the boiling sugar syrup over the chopped chocolate and leave it aside for 1 minute. 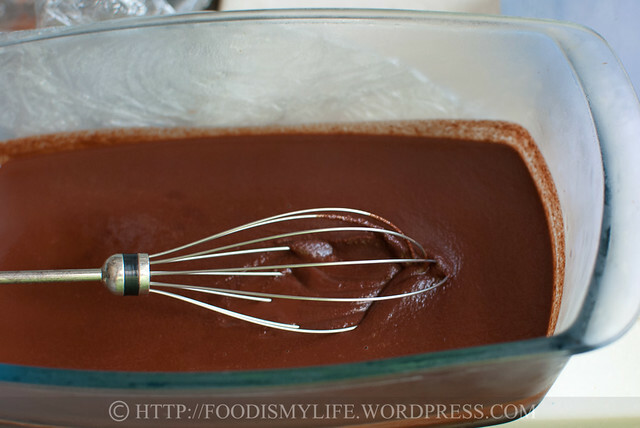 Stir with a whisk until the chocolate has fully melted and the mixture is smooth. 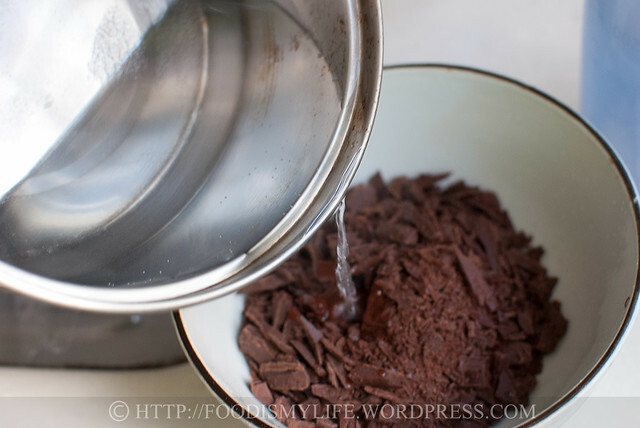 Strain the chocolate into a large container – cover loosely and freeze for 30 minutes. Remove from the freezer and whisk the chocolate until the lumps are gone. Repeat the process for another 3 times – freezing for 30 minutes, then whisk and freeze again – then cover tightly and freeze till firm, at least 4 hours. Make ahead: The sorbet can be stored in the freezer for up to 1 week. adapted from Pastry Friends (aka Keiko’s Cakes) – please head over here for the step-by-step photos. Preheat the oven to 200 degrees Celsius. Line a baking sheet with baking parchment. Pipe 8 to 10 mounds of choux (depending how many are you serving) onto the baking sheet, leaving 2 inches of spacing between each choux. Bake the puffs for 20 minutes at 200 degrees Celsius. Reduce the heat to 175 degrees Celsius and bake for another 25 – 30 minutes until the puff is golden brown and well-risen. During baking, no matter how excited you are, do not open the oven to check them as it will cause them to deflate and it’ll be the worse thing to happen ever. Make ahead (choux): After piping the choux pastry on the baking sheet, freeze the choux for 1 hour. Remove the choux from the baking sheet and wrap with 2 layers of cling film (plastic wrap). Keep them in a freeze-proof bag and keep them frozen for up to 2 months. When ready to bake, bake them (no need to defrost) at 200 degrees Celsius for 20 minutes then at 175 degrees Celsius for 35– 40 minutes. You can mix in the eggs by hand instead of using an electric mixer, but it’ll take a slightly longer time to be incorporated. You may not need to use all of the eggs, so it’s important to know the consistency of the dough and know when to stop adding eggs – check out the video I’ve mentioned in Note . Line 10 3-inch tarts (height of 0.5-inch) with the tart crust. Refrigerate for 15 minutes (alternatively, freeze for 5 minutes). 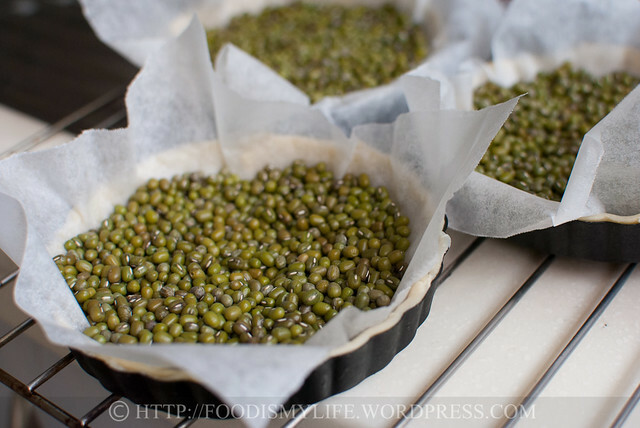 Place a piece of parchment paper over the tarts and fill it with pie weights. Bake for 10 minutes. Remove the pie weights and parchment paper and bake fror another 5 to 10 minutes until the crust is firm to the touch. Place the pies on a wire rack to cool while you prepare the filling. Reduce the oven temperature to 160 degrees Celsius. 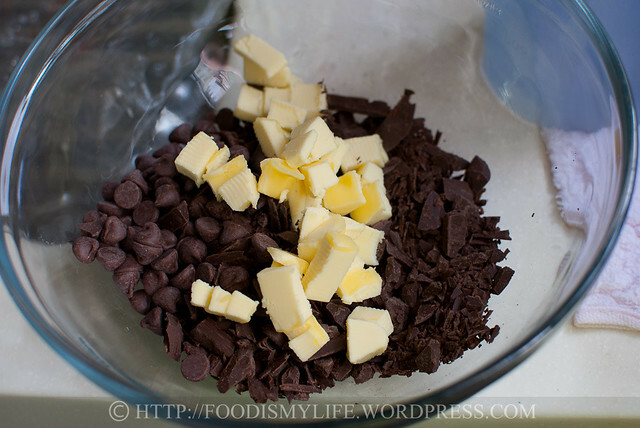 Combine the chocolates and butter in a large bowl. 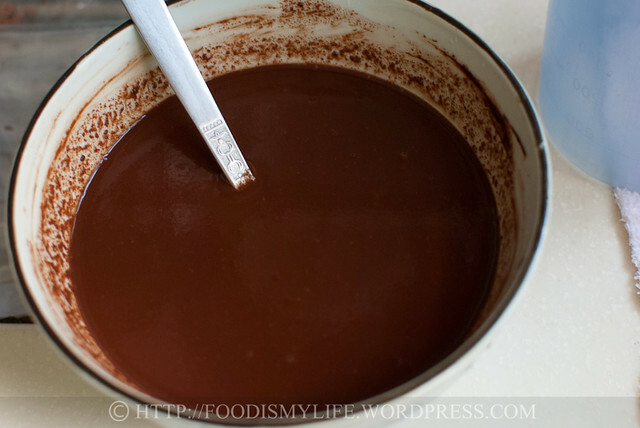 Heat cream until just below boiling point and pour it over the chocolate. Leave it aside for 3 minutes. 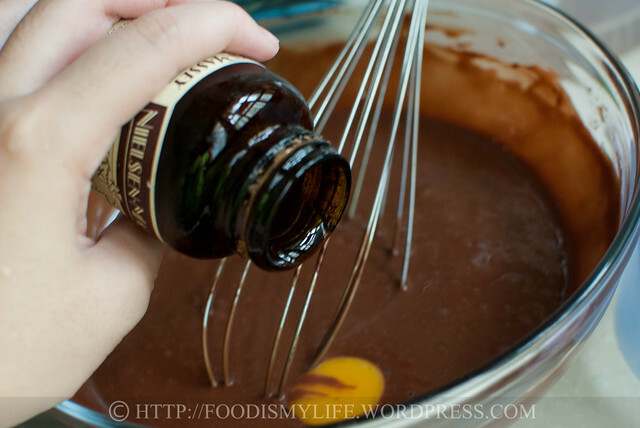 Whisk together until the chocolate has completely melted and mixture is smooth. Leave it aside to cool for 15 minutes. Whisk in the eggs, 1 at a time, until the egg is fully incorporated. 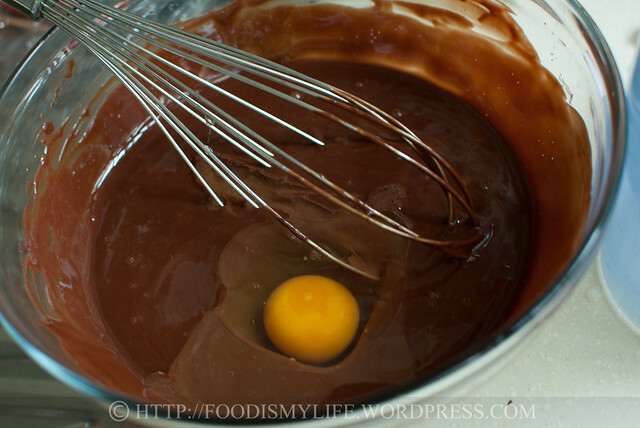 Whisk in the egg yolk and vanilla extract / paste until fully incorporated. Divide the tart filling among the tart shells. Bake for 20 to 25 minutes until the tart filling has set but still have a slight wobble in the middle. Let the tarts cool completely on a wire rack. 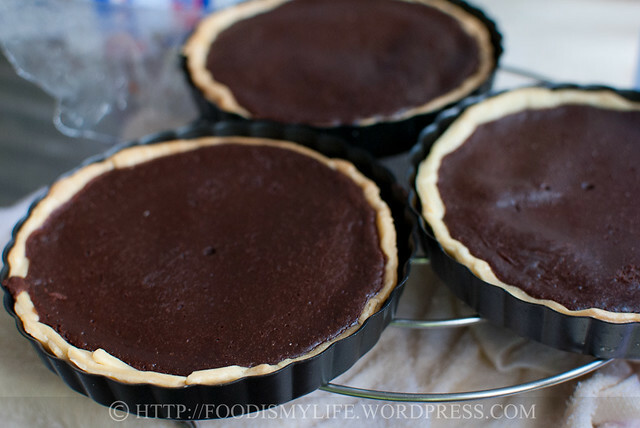 Make ahead: Store the chocolate tarts, tightly wrapped, in the refrigerator for up to 2 days. Let it come to room temperature before serving. Alternative: Line 1 10-inch tart pan and blind bake for 10 minutes. Remove the pie weights and bake for another 5 to 10 minutes. Fill with tart filling and bake at 160 degrees Celsius for 20 to 25 minutes till filling has set. Let cool completely and slice into 8 to 10 slices. 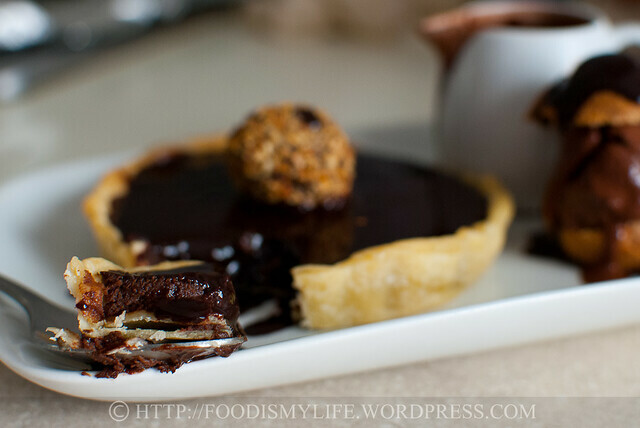 adapted from MasterChef Aria Chocolate Tart by Poh Ling Yeow – please head over here for the step-by-step photos. This is really amazing! You can already tell how good it is just by looking at it! Thank you for the compliments Vera! Hey this look s amazing! I can’t imagine how delicious it is! Fantastic images! Really nice job! Thank you so much 🙂 Glad you like it, it’s uber chocolatey that I’m literally in a chocolate coma! Awww thank you Zoe, you’re so sweet! Thank you! Oh hope you recover soon, so you can indulge, once in a while will be fine I’m sure 😉 Take care! as always, am absolutely in love with your beautiful pictures! 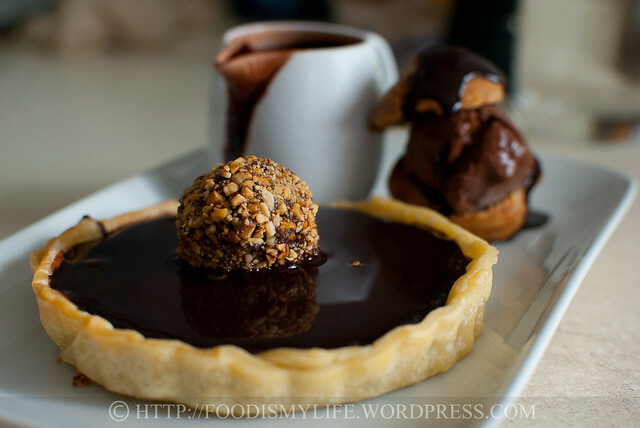 this dessert looks to die for, perfect for a chocolate lover like me! Wow, your dessert looks super delicious! 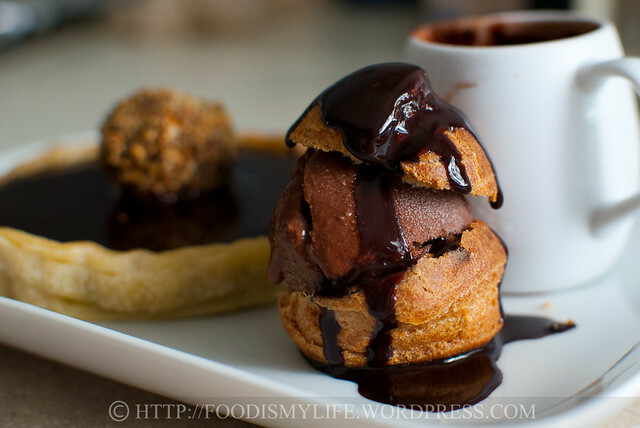 I’m drooling over the chocolate sauce! Seems like a whole lot of work, but definitely all the efforts paid off with one delicious bite! What a beautiful looking dessert! So much hard work has gone into making and plating this dessert. Great job! Wow, this looks amazing Jasline. I need to have a plate of this! Lovely photos! Especially like chocolate torte, or anything similar. Beautiful dessert, as always gorgeous photo’s clear and well written instructions. Chocolate, my favorite and this is a bounty of delicious! I’m not usually a fan of chocolate, but this dessert looks so decadent! Oh wow I think I’m going into chocolate over drive right now…. Gorgeous and rich and yummy and totally NOT allowed in my house as both I and my nephew (who’s caring for me after my surgery) will be ‘dieting’ or at least avoiding excesses calories. 🙂 They look SO good though. WOW Jasline! I want it all!